I woke in my bunk that morning and could not for the life of me figure out where I was in the first 30 seconds. The gentle rocking and serious lack of head room didn’t even give it away. I was dazed and confused! This was not an uncommon state of mind for me to wake up in these day! I wiped the porthole and looked out. I’M IN ANTARCTICA! Of course I was! I had just spent the last five days sailing past Cape Horn and across the Drake. How could I have forgotten, even in the earliest seconds of my waking day! There was no mistaking the scenery outside. It was magnificent. Awe inspiring! As my consciousness slowly caught up with the rest of me, the reality of my situation came crashing through my drowsiness, I smiled. I was not only in Antarctica! Today was V-Day. Today was the day Rhonda and I would land on it’s shores! 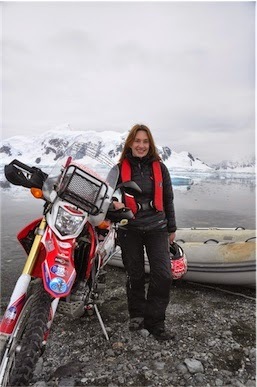 Today I was going to ride my motorbike on Antarctica! This day was about achieving a personal goal andrealising what initially seemed an unrealistic goal. It was about taking the rough with the smooth, fighting the fears, concerns, hurdles and naysayers and getting rewarded for it. I was going to actually do it and nothing else at that moment mattered! From now on I knew I could do anything if I wanted it badly enough. Hard work and sheer pig headedness will take you a long way. That, and treating people with respect along the way. It may sound corny but it goes a long way! Be yourself. Be genuine. Be open. You never know who might come back to help you realise your dreams! We left Ushuaia on Sunday. There were 9 of us on board the Ice Bird. The 60 foot expedition yacht that was going to take us across the notorious waters of the Drake Passage and over to Antarctica. It would take us a few days to cross. The exact time was yet to be seen. It all depended on the conditions that the Drake decided to throw at us. We were at her mercy and the current forecast threatened a storm near the tail end of our journey. Based on the weather pattern, it could be a 5 day delay if we decided to wait and so the decision was made to go for it. Final preps are underway. The team are on board and the special guest (Rhonda the Honda) has been unceremoniously winched in to place and bagged up! I genuinely felt sorry for has we placed the black bag over her head and duck taped it in place. I have removed the battery, taped up the air filter, oiled the chain and sprayed her all over with WD40 before wrapping her with cling film and taping her up with duct tape. Its not the perfect solution but I'm not sure there is one. No one has ever tried sailing a motorbike across the drake before and so the solutions are not readily on hand! Once we arrive we will wash her down and hope for the best. I have come on board a week early as hotels here are very expensive and Cath (the skipper) invited me to stay. I am earning my keep by helping prep the boat in anticipation of our voyage across the Drake Passage to Antarctica. This is a whole new world for me and one I have been a little worried about! 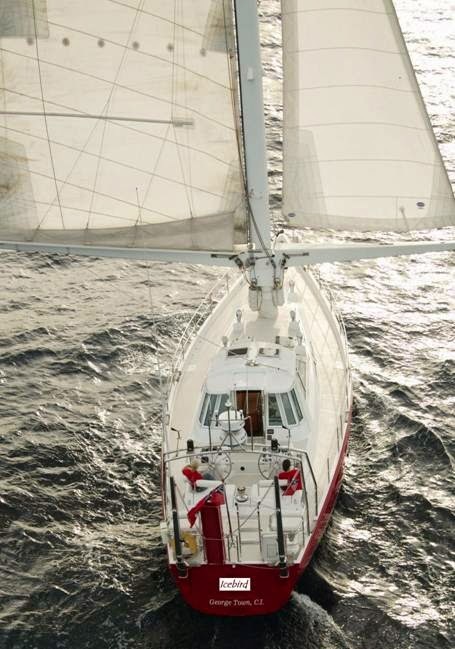 Not only do I face the crossing of one of the roughest crossings in the world in a 60 foot sailing yacht but possibly more scary is the thought of spending 3 weeks (or 4 if you include the week at the port) with 8 other people in very cramped conditions! Day one and I have been mostly cleaning the boat. I haven’t done any of this domestic stuff for over 10 months now. Actually I've quite enjoyed getting busy and singing as I go! It’s quite interesting learning to adapt to to the tight corners and low ceilings. Making a bunk up was very amusing!! I think I’ll enjoy sleeping in it though. Certainly whilst in the doc and I have the gentle rocking. The crossing is going to be a whole different ball game. Another luxury of the doc is that I have a cabin to myself and loads of sleeping space compared to what I will have when we start sailing. Once everyone is on board I will have to move to another bunk and squeeze me and my stuff in where I can along with everyone else. We will all have to get on and we will all take it in turns to cook, keep watch, clean etc etc. I have no idea what the etc etc stands for but I have a feeling I will soon learn.